Ask fellow campers about "Ellsworth AFB FamCamp (Military FamCamp)" and nearby attractions. Great FamCamp, free laundry facility, level concrete pads, friendly service. We camped at Ellsworth AFB FamCamp (Military FamCamp) in a Fifth Wheel. Had some problem with directions to the park but the office staff they were in process of correcting the issue. Park has two sections. Older part is in several wagon wheels with all back-in sites. Our site was not really long enough for our 42' 5th wheel and truck and there was a tree blocking part of the site in the back. The newer section is all pull thru. All sites have concrete pads, patio, table and grill. FHU, free wi-fi ( sporadic), no cable but satellite worked fine and got quite a few OTA channels. Small but adequate commissary and exchange. Base gas station did have diesel Bowling alley, golf, theater are all on base and a nice air museum ( free!) right outside the main gate. This was a good location for seeing all the area sites. We camped at Ellsworth AFB FamCamp (Military FamCamp) in a Fifth Wheel. Nice park. All sites have concrete pads and are level. Unfortunately, our site (#21) had an awkward position with site #22 backed right to our door, a sewage manhole cover right next to the patio complete with sewage odor, and significant cracks and erosion under the pad enough to cause the pad to crack. A feral cat lived in the hole under the patio (much to our dog's delight). It seemed every other site was better than ours, but it was tolerable for a three night stay. If you don't get site #21, I'm sure you'll be OK. We camped at Ellsworth AFB FamCamp (Military FamCamp) in a Motorhome. Lots to do in the area. Mount Rushmore, Crazy Horse Monument, and Spearfish Canyon are great sights. Lots of microbreweries in the area; Sturgis motorcycle museum is within easy travel distance. Very nice park. The park is in a wagon wheel layout which gives each RV plenty of room. There is sun and shade, very clean restrooms and laundry rooms, and the grounds are kept up and mowed regularly. The roads are paved and the pads are concrete. All utilities worked fine. The park is set near 2 of the base gates - convenient; and the base isn't so far out of town that it is inconvenient. Our only complaint was the wifi was too slow - we used our hotspot. Otherwise, very nice! 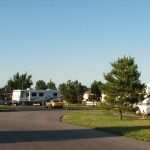 We camped at Ellsworth AFB FamCamp (Military FamCamp) in a Fifth Wheel. Nice concrete pads. FHU. No cable and weak WIFI. Shower house had 4 stalls, and the laundry was free. Convenient to the Exchange and Commissary, and the Air Museum is worth a visit. The aircraft displays outside are pretty good. We camped at Ellsworth AFB FamCamp (Military FamCamp) in a Motorhome. Interior roads gravel but good ability to maneuver. Sites are all large level concrete pads with patios, table and grill. Decent grass (could certainly use more water). Front office staff very helpful and friendly. Nothing bad to say about this park except the WiFi is truly awful. If we required service we had to go to the BX and we could get excellent WiFi, which doesn't make sense to me. Would definitely stay again. We camped at Ellsworth AFB FamCamp (Military FamCamp) in a Motorhome. Great place for visiting Mt Rushmore, Badlands, Sturgis, Deadwood, Custer State Park. Very close to Rapid City with plenty of shopping and restaurants. Don't miss Bear Country USA and Reptile Gardens! This is an Air Force FamCamp, so you must be active duty or retired military. First of all, this is a great location to explore the Black Hills area. Mt. Rushmore is 28 miles away. You could use this as a base to explore the Badlands National Park, 82 miles away, but I would recommend the White River KOA. The scenery in the FamCamp isn't that great, but it's got some trees and grass. It's by a school and housing area. Flat concrete pad for every site. $23.00 FHU. It has a convenient sidewalk to walk dogs. It is inside the base, so security is good. Our dish TV worked fine, our Sprint cell phone worked fine, and the WiFi is decent. Technically, it is against the rules, but if you walk your dog to the area labeled FamCamp Expansion, you can take your dog off-leash and play catch with him. I had to run after my dog when she stopped playing catch and chased 3 mule deer that had jumped the fence. We camped at Ellsworth AFB FamCamp (Military FamCamp) in a Motorhome. The Air and Space Museum just outside the gate is worth a visit. Be sure and visit Mt. Rushmore, and Needles Highway. Take Needles in a car or nothing larger than a big SUV. RVs will not fit through the one lane tunnels, but the amazing rock formations are worth the drive. Buffalo and wild burros can be seen in Custer State Park. Stop and ask the ranger station where they are. This is our go-to park in Rapid City. Concrete pads, well-landscaped. Good hookups although this time the water had a bad taste, may have had something to do with utility work inside the park. We camped at Ellsworth AFB FamCamp (Military FamCamp) in a Motorhome. 5 days/nights while touring the area. Gravel roads, easy in & out. Concrete pads with full service. Being on the base is reassuring for security. Exchange & fuel station close at hand. Underwent a severe hailstorm (no damage) and the base had loudspeakers that kept you informed of the storm's progress...nice feature. All in all, a very pleasant stay. We camped at Ellsworth AFB FamCamp (Military FamCamp) in a Motorhome. Pretty basic AFB campground. We had a backin site that was spacious & level. The office is only open from 9-1 & checking isn't until 2pm. We arrived early & were able to get our site assignment from the office without having to track down the camp host (reservations had been made by phone). Despite being straight across from the office the wifi didn't work. Very convenient access through the Patriot gate. The laundry is free but was always busy. We ended up using Mikes Laundromat just outside the Patriot Gate. We camped at Ellsworth AFB FamCamp (Military FamCamp) in a Motorhome. Pulled in at Saturday mid-day. Called the camp host (as sign instructed) and got a busy tone for two hours and no answer at their site. Picked a spot and set up. Main sites are concrete pads and very level. Some shade, but not a lot. Not very busy this time of year. Had a couple pretty windy days. No playground nearby, but you can visit the gym and find a HUGE playground. There's a gas station/AAFES Express right across the street. Wifi is decent. Pretty quite area since it's a couple miles from the highway. Bad part- men's restroom wasn't checked before the weekend arrived. No toilet paper, paper towel dispenser didn't work, one soap dispenser broken, and the showers were filthy. (I could rub the mildew off pretty easily, so why can't they?) We camped at Ellsworth AFB FamCamp (Military FamCamp) in a Tent Trailer. Only stayed 2 nights on the way cross country. Very nice campground. Easy in and out thru the Patriot Gate which is only open weekdays and closes at 6 PM. Nice spacious sites with back in sites having more space than the pull throughs. Laundry is FREE!! Noise was not that much of an issue as it was overcast and probably fewer jets were flying over the weekend. Small post with an adequate commissary and PX. Reservations were made by phone and all check in information left for self check in. There is a camp host, but we never saw nor needed her. Very enjoyable stay with good utilities. We had one of the few trees in the park so no satellite, but good antenna for several channels. We would stay here again. We camped at Ellsworth AFB FamCamp (Military FamCamp) in a Motorhome. We've found in our travels that many military campgrounds are an afterthought to MWR when it comes to management, and after two visits this year we've had it confirmed here. Our first visit earlier this year, we never saw the host during a three week stay. This time, we were assigned a site when making the phone reservation, only to find out after we had arrived and set up (no one answered the host phone) that we had to move for a "long term camper" in spite of there being many empty sites. We moved and watched as the site we moved from was occupied for one night and then was vacant. In addition to having to move for no reason other then incompetent scheduling, the price of $28/night with no weekly or monthly rate is unreasonable for a military location of this average quality. We've found better locations in the Rapid City area for less, which removes Ellsworth as a military benefit. We camped at Ellsworth AFB FamCamp (Military FamCamp) in a Motorhome. Very nice park. Level and full hookups. Plenty of space between RVs. Easy to find: enter Patriot Gate and take first right. Verizon service is very good. WIFI good. Only about 30 miles to Mount Rushmore. Highly recommend. We camped at Ellsworth AFB FamCamp (Military FamCamp) in a Travel Trailer. Downtown Rapid City is worth visiting. Within driving distance for day trips to Mt Rushmore, Black Hills, Crazy Horse and much more. Beautiful scenic drives. Closest gate for RVs to get through is the Patriot Gate (turn right at the 4-way stop) but it's not open on weekends and closes at 6:00 pm. The Main gate (go straight ahead at 4-way stop) is always open. The traffic circle after the gate is easy to maneuver. If using the Patriot Gate turn right at the first road after the gate (Lincoln Dr). Campground office is the first right. Note that the commissary is closed on Mondays. This area can get very windy. Be careful with your awnings and slide out covers. We had to use some beach balls and 550 cord to tie down our slideout cover. Recommend you bring those in EVERY time you leave as wind speed and direction is unpredictable. There's a large Menard's on the truck bypass, and strip malls along the interstate have all the usual dining and shopping sites. The Journey Museum in downtown Rapid City is exceptional and worth a visit. Are you affiliated with Ellsworth AFB FamCamp (Military FamCamp) ?